Pfizer believes in giving where it matters most, providing a new lease of life for heart patients under the Pfizer-IJN Foundation Patient Assistance programme. Pfizer Sales colleagues, Kio Soo San and Jennifer Lee visit a recipient of a double heart valve replacement surgery at the Institut Jantung Negara, Kuala Lumpur. The Pfizer SWAT Sharing With A Touch colleague community engagement programme seeks to create opportunities where Pfizerians share our time and resources in meaningful project. 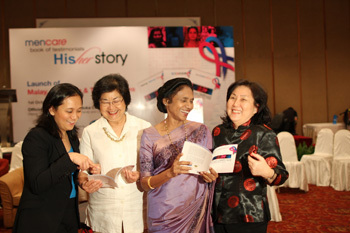 Azwar Kamaruddin, Pfizer Public Affairs Senior Manager with National Council of Women’s Organisation’s June Yeoh, Datuk Ramani Gurusamy and Dr. Ang Eng Suan at the launch of His Story Her Story, a compilation of testimonials of couples who battle breast cancer, from the MenCare programme. A unique proposition in raising awareness in breast cancer, MenCare highlights the need for men to support women in the early detection and treatment of breast cancer.